We have established a development project in the Dzogchen area in the central Kham-Dherge region of eastern Tibet. The Holy Dzogchen Area is a naturally beautiful and green environment of 21,000 square kilometers with elevations ranging from 2,400 to 7,000 meters. Surrounding the Dzogchen Monastery are thousands of snow mountains, hundreds of wonderful lakes, and dozens of waterfalls and hot springs. Half of the land is mountainous and the other is grassland. The area has hundreds of species of animals and birds, and thousands of plant species including medicinal herbs. There is a clear distinction among the four seasons; the temperature varies from minus 15 degrees Celsius in the winter to an average of 28 degrees Celsius in the summer. Currently, the 2,000 square kilometers of forest surrounding this area is sucumbing to disease and critical ecological degradation. 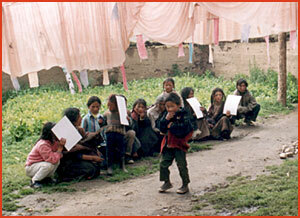 More than 12,000 people live in the Holy Dzogchen Area, comprising about 2,000 families. 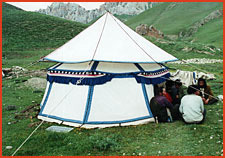 Sixty percent are nomadic and live in yak hair tents while forty percent are cultural artisans who live in wooden houses. 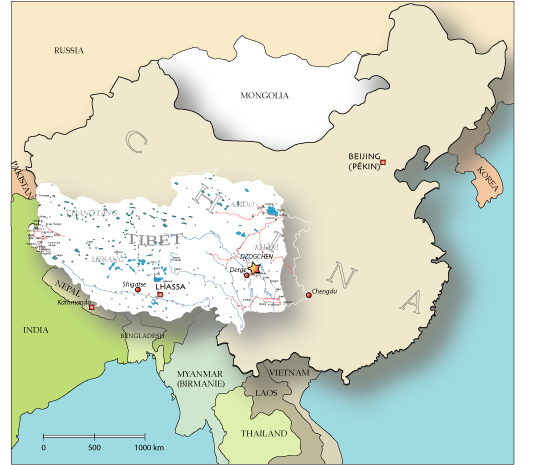 Many famous Tibetans hail from this region, including the most famous Tibetan king, Gesar Ling, who was born twenty-five kilometers from the Dzogchen Monastery. 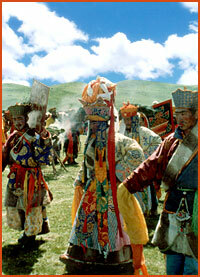 The history of King Gesar Ling is recounted in hundreds of volumes, setting the world record for the longest biography. 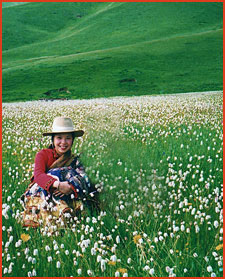 In the spring, during the Lhosar celebration (Tibetan New Year) there is a five-day flower blossom ceremony. During the summer festival in July, many Tibetans come for ten days of horse races, fire ceremonies, and cultural dances. In the autumn, for one month, the Dzogchen Valley holds a Dechen Zhingdrup (great bliss pure land practice) where everybody practices Dharma with the lamas. During the three winter months, local people teach cultural traditions--including art, singing, and dancing--to each other. The local Dzogchen people wear two styles of dress: woolen sweaters for the summer and sheepskin during the winter. Women adorn themselves with jewels and precious stones, while the men wear traditional nomadic gear. The local food consists of tsampa (barley), wheat, locally found vegetables, milk, yogurt, cheese, butter, meat, tea, and salt. Every day they have two large meals and three small ones. If food is available, local families welcome into their homes anyone in need of a meal. The entire population of the Holy Dzogchen Area practices Vajrayana Buddhism. Special prayers are recited every month on the 8th, 10th, 15th, 25th and 30th days of the Tibetan calendar. Most young boys become lamas at an early age, receiving an education from the Dzogchen Monastery. Girls may choose to join the nunnery. Later, both boys and girls have the option to continue monastic life or choose a lay profession. The people of the Holy Dzogchen Area have a reputation for being very kind, hardworking, and committed to Tibetan culture. They are extremely hospitable and generous to the more than 50,000 Tibetans who come every year to see Dharma dancing or in pilgrimage to the Holy Dzogchen Area. The locals take special care of the many lamas who come to study at Dzogchen Shri Singha Five Sciences University, as sixty percent of all the Dzogchen lamas are from other areas of Tibet. The Holy Dzogchen Valley is renowned in Tibet as a center of culture and Buddhism. We currently have programs providing the necessary guidance and information to assist anyone interested in visiting the Holy Dzogchen Area in the central Kham-Dherge region of eastern Tibet. Chengdu, the largest city in western mainland China, is only about 1,000 kilometers from the Holy Dzogchen Area. If you are interested in making a pilgrimage to Tibet, please contact any of the International Dzogchen Shri Singha centers. When you visit the Holy Dzogchen Area, we ask that you show respect for its culture and religion. The economic system, infrastructure, and housing situation in the Holy Dzogchen Area has remained unchanged for many years. Many local peoples' basic needs have not been met. Their living conditions are difficult -- many do not have adequate food and clothing or access to medicine. The Dzogchen Monasteries are barely able to support the education of the local children; as a result, most Tibetan children have no opportunity to attend school. Members of the older generation are worried about this critical situation and are seeking support to preserve their priceless heritage before it is lost forever. Our master, Dzogchen Khenpo Choga Rinpoche, is extremely concerned about the future of this precious area. He is encouraging other Buddhist masters who have connection to the Dzogchen Monastery to help in saving this sacred Dzogchen area. He compassionately wishes to build a school and a hospital there. He has often said, "I feel great love for the Dzogchen Valley, and I really love the Dzogchen people. We must contribute to save this Holy Dzogchen Area. I ask everyone to please help." To learn about the educational and health development project for children in the Holy Dzogchen Area of Tibet, visit the Helping Tibetan Children page. Under the direction of Dzogchen Khenpo Choga Rinpche and Dzogchen Gedrak Rinpoche, we are now building a Loving Kindness Care Center to serve poor elders in the Holy Dzogchen Area (estimated cost $175,000 USD). We intend to construct a new hospital that offers both eastern and western medical care, in order to expand the services provided by our very small existing Tibetan Medicine clinic (estimated cost $200,000 USD). For the last few years, Dzogchen Khenpo Choga Rinpche and Dzogchen Gedrak Rinpoche have supported the education of several hundred young lamas. Unfortunately, as of February 2004, the key patron for this project was no longer able to continute his support. We need new sponsors to support the education of three hundred young lamas to preserve the Dzogchen Monastery and the Dzogchen tradition (monthly rate of $30 USD per lama). 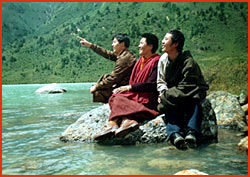 It is very important that the environment of the Holy Dzogchen Area be preserved. We need donations and expertise for the renewal and protection of the surrounding forest and countless pure natural springs that come from the hills and mountains in this high plateau. There is currently no electricity available in the Holy Dzogchen Area. We are seeking donations and expertise to bring solar and wind power generation into the area. the Holy Dzogchen Area in eastern Tibet.